I’ve always been a fan of Reese&apos;s chocolate peanut butter cups… just not the ingredient list that goes along with them! This low-carb version is far healthier and is devoid of any nastiest included in the original, without compromising on taste. A note on the chocolate — I like these best with a really dark chocolate like Lindt 90%, however they’re closer to the original if you can find a good keto-friendly milk chocolate. Either use this in place of the dark chocolate, or use half dark/half milk. 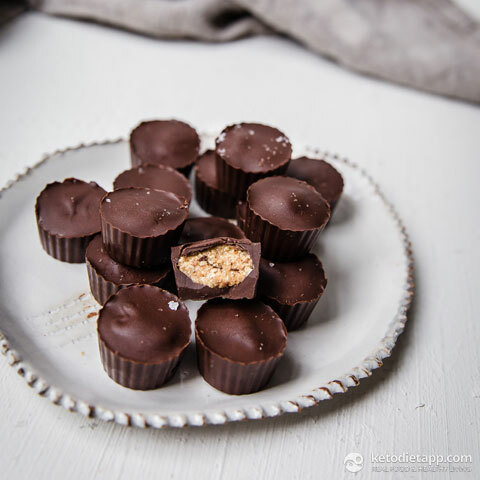 I love these cups finished with a sprinkle of sea salt — not entirely conventional, but the subtle bursts of saltiness combined with the sweet, creamy chocolate and nut butter go together amazingly. 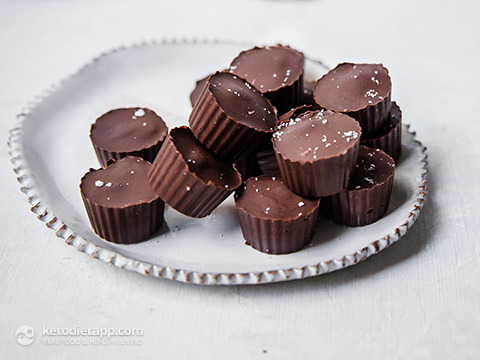 If you do add the sea salt make sure you add it after the chocolate has set, otherwise it will melt into the chocolate. Note: You can use peanut butter if you can tolerate legumes. Can&apos;t eat nuts? Try toasted coconut butter or sunbutter. 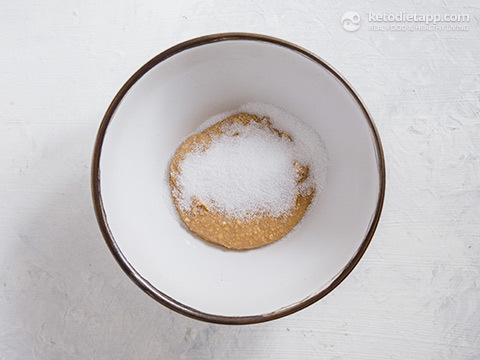 Mix the nut butter and erythritol together in a small bowl, and place in the freezer for at least 10–15 minutes to harden (do not use granulated sweetener or the cups will be gritty). In the meantime, prepare the chocolate by roughly chopping it, and melt it over a very low heat on the stove, stirring constantly. If it appears to be getting too hot, remove from the heat and keep stirring – the chocolate will continue to melt. 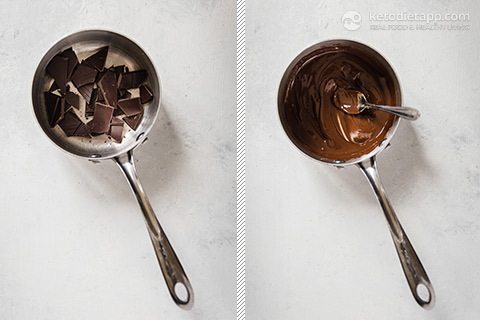 Once all of the chocolate has melted, place about a teaspoon full into the bottom of each mould, and use teaspoon to coat the sides of the mould with the chocolate (alternatively you could use a pastry brush to do this). This should use roughly half the chocolate. Set the rest aside, and place the moulds in the freezer to harden. 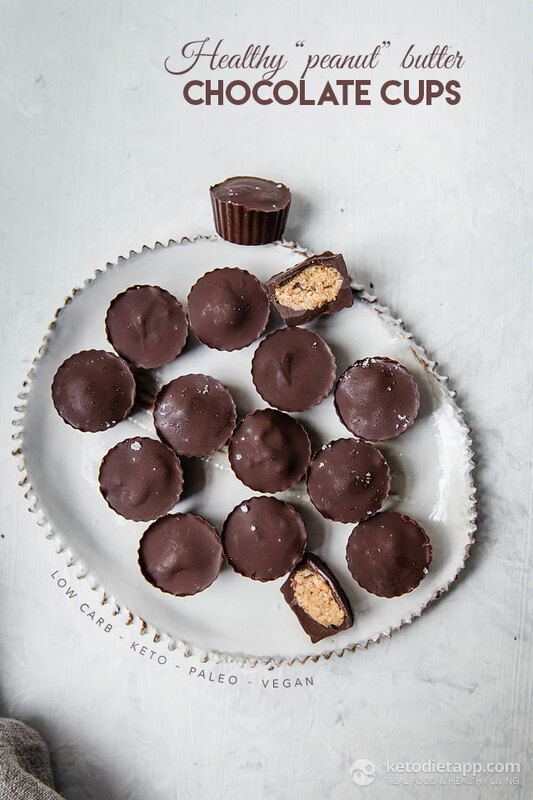 Remove the nut butter mix, and roll into small marble-sized pieces. 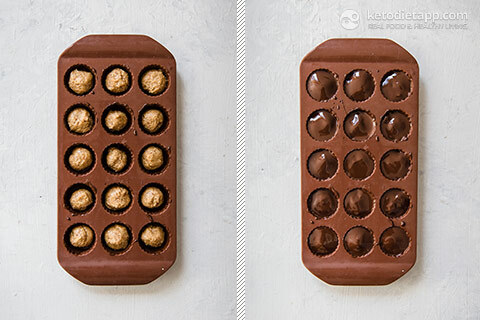 Remove the moulds from the freezer, and place a nut butter ball in the centre of each, on top of the hardened chocolate. 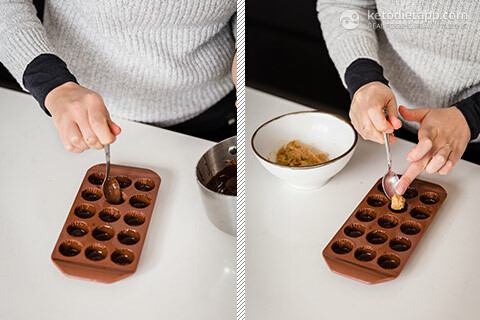 Pour the remaining chocolate evenly over the top of each to fill each mould. Note that you may need to heat up the remaining chocolate if it has started to set to ensure it pours easily. Place the moulds in the freezer or fridge to set. Once set, sprinkle with sea salt flakes (can be skipped but is highly recommended!). Store in the fridge in a sealed container for up to one month. One serving (cup) is about 15 grams (0.5 oz). I also have one tip for other people like me who want a more peanutty taste but are staying away from peanut butter. I add 2-3 tablespoons of toasted sesame oil with just 1T of almond. It makes the flavor just a bit more peanutty! Thank you again!!! 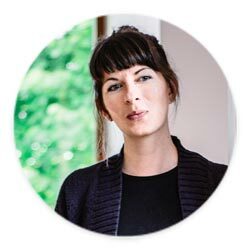 Hi Marianna, thank you for your feedback! I will add more info now, it is only 1 cup/serving.